Santa Fe, NM, July 27, 2015—In its fourth year of grant making to Commonweal Conservancy, REI recently announced a generous gift of $7,500 to support the development of over two miles of publicly accessible trails at the Galisteo Basin Preserve. The Preserve’s existing trail network includes 25 miles of hiking, mountain biking and equestrian trails. Over the past nine years, the trails of the Preserve have grown in popularity to become one of the region’s most beloved recreational resources. According to recent surveys, more than 18,000 hikers, mountain-bikers and equestrians enjoy the Preserve trails each year. 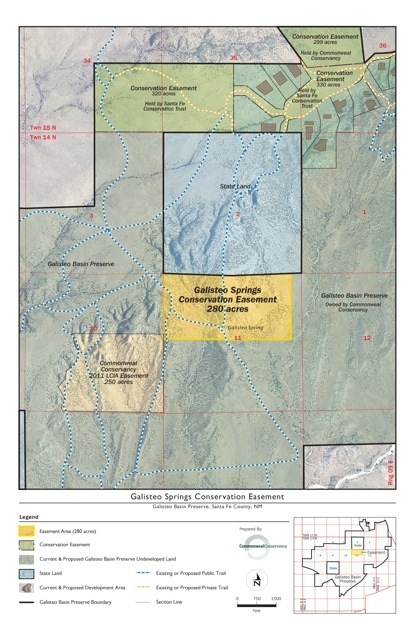 Santa Fe, NM, November 2, 2011—The New Mexico Department of Cultural Affairs (DCA) has acquired a 280-acre conservation easement over the culturally and ecologically significant Galisteo Springs property in central Santa Fe County's Galisteo Basin Preserve. In partnership with local nonprofit organizations Commonweal Conservancy and the Santa Fe Conservation Trust, DCA purchased the easement through capital outlay funds granted by the 2010 New Mexico State Legislature and administered by the New Mexico Energy, Minerals, and Natural Resources Department (EMNRD). “This acquisition will support a more holistic understanding of the region’s cultural history, as well as conserve a freshwater resource of critical biological significance.” said Ted Harrison, president and founder of Commonweal Conservancy. Santa Fe, NM, September 1, 2011—Commonweal Conservancy committed 250 acres along the northern rim of the Galisteo Basin to permanent open-space protection today through the donation of a conservation easement to the Santa Fe Conservation Trust. During the past three years, Commonweal has overlaid nearly 3,000 acres within the nationally acclaimed Galisteo Basin Preserve with conservation easements. In collaboration with the Santa Fe Conservation Trust, Commonweal’s easement donations will ensure that the scenic, cultural, recreational, agricultural, and wildlife habitat resources within central Santa Fe County’s iconic Galisteo Basin will be forever protected. Santa Fe, NM, September 2, 2010—Commonweal Conservancy and the Santa Fe Conservation Trust announced the award of a $350,000 grant toward the acquisition of 400-acre parcel protecting Galisteo Spring near Lamy, NM. The property shelters the most significant water source for wildlife on the Galisteo Basin Preserve. The spring has also been used for centuries by numerous cultural groups either passing through or settling in the 740-square-mile Galisteo Basin. The Galisteo Spring project represents a three-way partnership between the Santa Fe Conservation Trust, Commonweal Conservancy, and the New Mexico Department of Cultural Affairs. It preserves the context of several culturally significant archeological sites, provides a critical link to other conserved parcels in the region, and represents another step toward Commonweal’s ultimate goal of protecting 12,000 acres of natural open lands, wildlife habitat, scenic views, and public trail networks. Santa Fe, NM, February 2, 2010—On February 9, the Santa Fe Board of County Commissioners (BCC) will be asked to advance the initial phase of a path-setting, environmentally responsible community plan, known as the Village at the Galisteo Basin Preserve. The mixed-use, mixed-income Village and the 13,522-acre Preserve have won national acclaim for integrating landscape-scale conservation, water and energy efficiency, and clustered community design. BCC approval of the Village Phase I preliminary plat would be a significant statement about the county’s own emergent sustainable development-oriented management plans and development regulations. Santa Fe, NM, November 24, 2009—Commonweal Conservancy has reason to give thanks a couple days early this year: 600 acres of open space was donated Monday to the Santa Fe-based nonprofit organization spearheading the creation of the 13,522-acre Galisteo Basin Preserve. The donation, valued at $1.86 million, was overlaid with a conservation easement, which Commonweal donated to the Santa Fe Conservation Trust (SFCT). Santa Fe, NM, June 19, 2009—The Santa Fe County Development Review Committee (CDRC) voted unanimously to approve Commonweal Conservancy's preliminary Phase I plat for the proposed Village at the Galisteo Basin Preserve. "The Committee’s vote is a profound and timely endorsement of inclusive, conservation-based, and resource-efficient community development," said Ted Harrison, president of Commonweal Conservancy. Santa Fe, NM, October 23, 2008 – The National Building Museum exhibition featuring Santa Fe County's Galisteo Basin Preserve opens today in Washington, D.C. Green Community, the first major exhibition in the United States to explore the complexities of creating and sustaining healthy communities, introduces projects from around the world where citizens, leaders, designers and developers are working together on innovative planning solutions. Santa Fe, NM, October 10, 2008 – The National Building Museum will feature Santa Fe County's Galisteo Basin Preserve in its Green Community exhibition, opening October 23 in Washington, D.C. Green Community, the first major exhibition in the United States to explore the complexities of creating and sustaining healthy communities, introduces projects from around the world where citizens, leaders, designers and developers are working together on innovative planning solutions. The National Building Museum chose to include the Galisteo Basin Preserve as an example of landscape-scale conservation development. Santa Fe, NM, September 23, 2008 – Commonweal Conservancy has donated a 320-acre conservation easement valued at $1,225,000 to the Santa Fe Conservation Trust. The donation, presented on September 19, is among the highest valued conservation easements received by the Trust in its 15-year history and is the first of a series of easement donations the non-profit Commonweal will make to protect the Galisteo Basin Preserve. The 320-acre Galisteo Basin Preserve easement is also among the first to apply for a transferable tax credit through New Mexico's expanded program. Santa Fe, NM, April 28, 2007 – Commonweal Conservancy has completed its third land acquisition toward the planned 13,222-acre Galisteo Basin Preserve. Located in central Santa Fe County, the Galisteo Basin Preserve is a conservation-based community development initiative that will include more than 12,000 acres of protected open space. Monday's 2,444-acre land purchase brings the total acreage owned by Commonweal Conservancy to 8,235 acres, or more than 62 percent of the entire Galisteo Basin Preserve. Santa Fe, NM, July 27, 2007 – The Village at Galisteo Basin Preserve announced today that it is one of 234 projects—and by far the largest of three in New Mexico—to be accepted into the United States Green Building Council's Leadership in Energy and Environmental Design (LEED®) for Neighborhood Development Pilot Program. Santa Fe, NM, June 13, 2007 – On June 12, 2007, Santa Fe County's Board of County Commissioners (BCC) voted 4-1 to approve Commonweal Conservancy's master plan for the Village at Galisteo Basin Preserve. Approximately 30 residents from Galisteo, Lamy, Eldorado, and elsewhere in Santa Fe County attended the public hearing. Perhaps without precedent for a project of this scale, not a single voice of opposition was raised during the three-hour hearing. Santa Fe, NM, March 15, 2007 – The Santa Fe County Development Review Committee (CDRC) unanimously approved (7-0-0) Commonweal Conservancy's master plan for the Village at the Galisteo Basin Preserve.